In this post, Ashley Coblentz, Jackie Moreno, and Brian Digate take a closer look at stories that matter. Have you seen high school students conference as well as these elementary students? Outcomes: We still give students the option to write with paper, but the digitization of the writing process has created inspired writers in our classroom and has taken the writing process to new heights. Students feel more motivation to write because they know that more readers will have access to their work now that they can share multiple copies digitally. They have more stamina and enthusiasm for writing than ever before. Instead of teachers giving students printed graphic organizers, where they have to fit their ideas into our structure, students use Popplet to create their own graphic organizers, customizing them in a way that allows them to take ownership of craft and structure. After planning using Popplet students draft their piece in Pages or another word processing app. Before it was difficult to know what students were discussing during peer writing conferences unless we were right next to the kids. Now students are able to record their thoughts about potential revisions and edits in the app Educreations, using a CCSS-based rubric and sending conference links to teachers and each other. We have noticed a dramatic increase in use of academic language and focus during this part of the writing block. One of the most powerful outcomes is how much having access to videos of students talking about their writing has improved our formative assessment practices, which in turn, has greatly improved the instruction we offer our students. Students love when it’s their turn to share a published story. Students used to only be able to publish only one copy of each of their stories, and it was typically read by only a few students who got their hands on it. Now students can send their work to their classmates’ iBooks libraries, and every single student in the class and beyond can have a copy of that story, accessible at any time, on their personal bookshelves. 1. 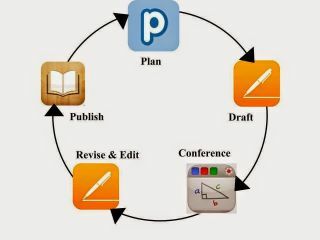 Plan with a graphic organizer app (Our favorites are Popplet and Idea Sketch). 2. Write rough draft in a word processing app (Pages or Google Docs). 3. Open writing rubric in Educreations to conference with a peer. 4. Have a writing conference-annotate draft. 5. Make revisions & edit in a word processing app (Pages for us). 6. Send to iBooks via email. Ashley Coblentz is a teacher at Sandburg Elementary in Madison, Wisconsin and a collaborative instructional technology leader in the Madison Metropolitan School District. She incorporates technology into all content areas to help students learn in transformational ways while addressing Common Core State Standards and World-Class Instructional Design and Assessment (WIDA) Standards. Read her blog at widaatwcer.blogspot.com. Jackie Moreno is a bilingual instructional coach and library media technology specialist at Sandburg Elementary in Madison, Wisconsin, and a former teacher of English and Spanish language arts. Jackie collaborates with educators to cultivate student creativity and leadership in a 1:1 school. Read her blog at widaatwcer.blogspot.com.